Congratulations to Dr. David Lawton, a Music Department faculty member since 1969, on his recent retirement. 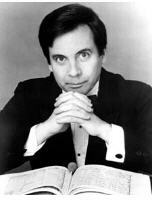 Lawton served as Artistic Director of Stony Brook Opera, and as Chairman and Director of Graduate Studies. He conducted the Stony Brook Symphony and full productions of varied operatic repertoire, including rarities from the eighteenth century to the present day. He continues to be a guest conductor for regional American opera companies. 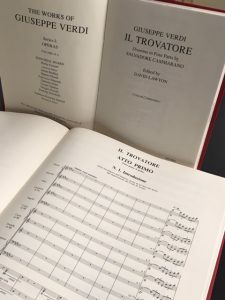 A noted Verdi scholar, Lawton produced critical editions of Macbeth (2005) and Il trovatore (1992) for The Works of Giuseppe Verdi (WGV), a joint publication series of the University of Chicago Press and Ricordi. 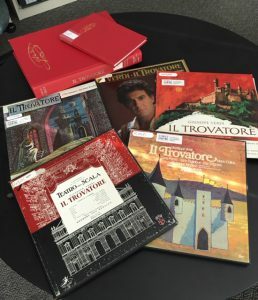 These print editions, available in the Music Library, are comprised of full orchestral scores for each opera, along with commentary. As Lawton states in the “Introduction,” and in the separate volume of “Critical Commentary,” the principal sources that he consulted for the WGV edition of Macbeth were Verdi’s autograph score of the original, 1847 version (Macbeth I) , and the autographed portions of the revised 1865 version (Macbeth II), which were inserted into a manuscript copy of the first version. The former is housed in the archives of Casa Ricordi, now located at the Biblioteca Nazionale Braidense, Milan. The latter, originally owned by the publisher Léon Escudier, is now in the Bibliothèque Nationale, Département de la Musique, in Paris. Lawton examined other manuscript copies of the original Macbeth. Among them, a copy at the Library of Congress in Washington D.C., contains autograph annotations by Verdi; another is in Italy’s Florence Conservatory Library and contains annotations in his hand as well. Macbeth I had its premiere, with the composer conducting, at the Teatro alla Pergola in Florence on March 14, 1847. Throughout the opera’s first performance, Maestro Verdi was called out to receive rapturous applause nearly thirty times. While overall the reviews from the premiere were mixed, Macbeth was revived in Florence in June 1847 and produced in other European cities from 1847-1848. The premiere of Macbeth II took place on April 19, 1865 at the Théâtre-Lyrique in Paris, to a much poorer reception. 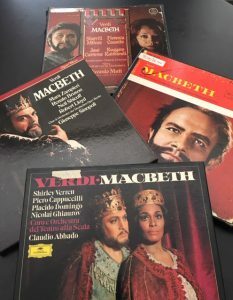 However, Verdi considered his revisions to be definitive; and critics of an 1874 revival at La Scala recognized Macbeth II as more modern than its predecessor, and more in keeping with new operatic trends. Lawton’s WGV critical edition “constitutes the first publication of either version of Macbeth in full score.” While the more popular 1865 version appears as the principal score in WGV, the 1847 selections appear in their original versions in an appendix, so that this edition may also serve for productions of the 1847 score. [i] From thorough examinations of the primary sources described above, and others such as correspondence and reviews, Lawton constructed a vivid chronology of the compositional genesis and reception history for both versions of Macbeth. “Indeed, to read the critical notes is to follow with amazing detail Verdi’s creative process…” wrote Harvard professor Daniel Albright, who delightfully described the differences between the two versions in his 2005 review. The Macbeth scores were edited with “scrupulous intelligence,” Albright stated, concluding that Lawton “has contributed significantly to one of the most distinguished series in the history of music publishing.”[ii] After its publication, Lawton was awarded the prestigious Claude Palisca Prize for best scholarly edition by the American Musicological Society in 2006. Thank you Dr. Lawton, for your contributions to music performance and scholarship, and your kindness and generosity toward the Music Library over the years. Best wishes for a happy and healthy retirement! 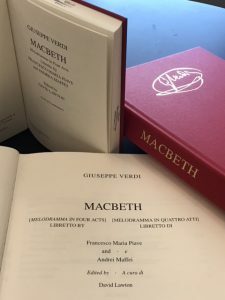 UPDATE: Productions of Lawton’s critical editions of Macbeth I (1847) and Le Trouvère, Verdi’s 1857 revision of Il trovatore for Paris, are currently taking place at the Festival Verdi in Parma, Italy. The official program appears at: https://www.parmaincomingtravel.com/events-parma/festival-verdi-2018-preview.aspx. The Trouvère production is the world premiere of Lawton’s edition, which will be published in 2020! [i] Historical information obtained from: Giuseppe Verdi, Macbeth : Melodramma in Four Acts. Libretto by Francesco Maria Piave and Andrei Maffei. Ed. by David Lawton. Series I, (Operas), Bd. 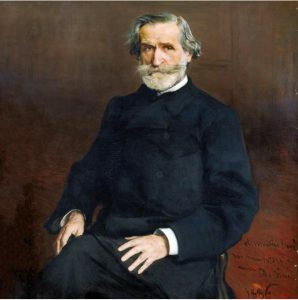 10 of The Works of Giuseppe Verdi (Chicago ; London: University of Chicago Press and Milan: Ricordi), 2005. [ii] David Albright, “Verdi’s Macbeth—the Critical Edition,” Opera Today: Opera News, Commentary and Reviews From Around the World,” 20 November 2005, http://www.operatoday.com/content/2005/11/verdis_macbeth_.php (accessed Sept. 19, 2018). [iii] Historical information obtained from: Giuseppe Verdi, Il trovatore : Dramma in Four Parts. Libretto by Salvadore Cammarano. Ed. by David Lawton. Series I, (Operas), Bd. 18a of The Works of Giuseppe Verdi (Chicago ; London: University of Chicago Press and Milan: Ricordi), 1992.